I’m sure that it would surprise few people to hear that I am a bit obsessed with everything putting related. The infatuation I have with all things putting extends beyond the actual club itself, which is why I was pleased to learn that I’d be reviewing a putting training aid called the Putting Alley Putting Stroke Isolator. The market for training aids is ever-growing and golfers are always looking for that drill or aid that could help them shave strokes from their game. In my opinion, there is no better area for that to happen than with a putting training aid. 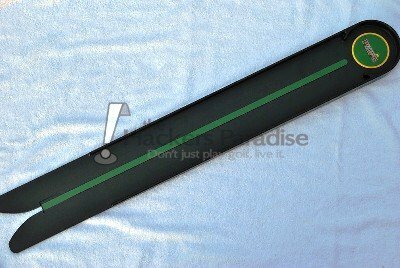 Putting Alley is a short putt practice device that uses a raised precise putting surface (27 inches long) as the putting “alley”. After putting, you can determine your putting error by seeing where the ball falls off the raised surface. Eliminate the inconsistent feedback of putting greens! Identifies main putting errors which are putter face angle, swing path and off center impact. Eliminates uncontrolled practice on irregular turf by providing a precise consistent putting surface. Portable – can use anywhere, rain or shine. Easy to use – practice a high number of repetitions in a short period of time without bending over to pick up the ball. Dual sided design with integrated precision Alleys on each side. High strength engineering polymer for precision and durability. When the Putting Alley arrived for me to review, I met it with some apprehension. Even though I looked at it on the company’s website, looking at a picture leaves a lot of room for the mind to wander. For me, it’s natural to have such thoughts about an item. Claims are always nice, but sometimes they can be misleading. In the end, that was not the case with the Putting Alley. According to the company, the Putting Alley is a “Putting Stroke Isolator”. In the most basic of terms, its main purpose is to identify the flaws in your short-distance putting stroke; specifically, the face angle of the putter. The company claims that face angle alone accounts for 80% of missed short putts and I tend to agree with that statement. Claims are fine, but what does it do? At its root, this is a 36-inch long and 4.75-inch wide two-sided training aid. The objective is to putt the ball up the incline of the device and into the cup while keeping the ball rolling down the middle on the 27-inch rail. One side possesses a 1-inch rail and the other a ½-inch rail for increased difficulty. If the putter’s face angle is off, the ball will not stay on the rail and will fall off before reaching the cup. Depending on which direction the ball falls off, the putter face is either open or closed upon impact. Since the device is constructed of hard plastic, it also forces the user to take proper speed into consideration. The ball has to get up the slope and into the cup without hitting it so hard that it skips out. First of all, I’d like to say this is a very well built training aid. The Putting Alley is made of a heavy duty plastic that is not flimsy or thin in any way. The weight also stands out instantly, as there is enough heft that prevents movement during the putting stroke. In addition, the label stickers on the rail and in the cup are heavy duty. I really have no concerns about how the Putting Alley will hold up over time. I spent a lot of time working with the Putting Alley. As a matter of fact, the device has remained set up on my putting green and gets nightly use. If there is one sure-fire way to shave strokes off your game, it is on the greens and with the short putts. The Putting Alley instantly reminded me of one of my favorite putting drills known as the ‘yardstick drill’. The yardstick is one of those putting drills that a vast amount of golfers know and use. You simply place a metal yardstick down on the practice area, putt the ball down it, and try to keep the ball on it all the way to the end. Where it falls off gives instant feedback to your stroke. Is this just essentially what the Putting Alley does? Yes and no. 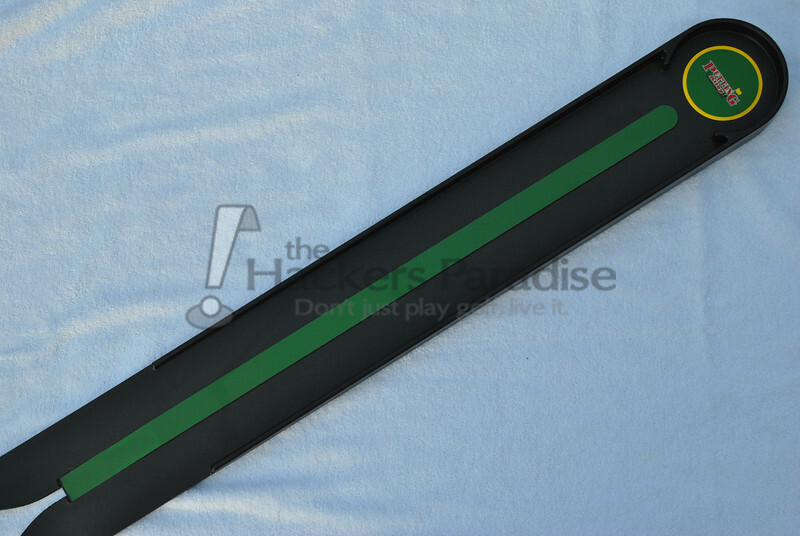 With the Putting Alley, you do get a shorter track to putt on than the yardstick (a 27-inch rail compared to the full 36-inch yardstick), but you also get a cup at the end and an incline that changes everything. With the incline, pace immediately becomes more of an issue. I found I could get away with a decelerating stroke on my yardstick, but the ball would not make it to the cup with the Putting Alley. By the same token, you cannot get away with just ramming it down the line aggressively, because the ball won’t stay in the cup that way. I really enjoyed the fact that the simple addition of an end target and incline made me focus on more than just face angle. It brought pace and swing path in to the equation as well. If putting on a 1-inch rail is too easy for you, flipping the Putting Alley over turns it into a whole new ballgame due to a slender ½-inch rail down the middle. Let me openly say, this side led to many frustrations, not because it was a bad training aid, but because it made me realize how inconsistent my face angle and pace were at short range. It honestly left me in a dither a few nights and my confidence waned after struggling on the smaller track. In the end, the ½-inch side is a useful one for me – in small doses. The Putting Alley is a well done training aid. It proved incredibly handy and added a twist to my putting practice, since I was able to get instant feedback on multiple aspects of my game. It’s well built, portable, and useful for a ton of feedback on the putting stroke. Is it revolutionary? Not in my personal opinion. Instead, I would call it a well-done take on an old classic. Could the same thing be accomplished with taking an old yardstick out of your garage? That is up to the individual. In my opinion, there is enough “extra” in the feedback category to make useful and certainly worth a look. The Putting Alley Putting Stroke Isolator comes in the standard edition pictured above with an MSRP of $49.95. In addition, there are “Tour Editions” made of different wood types with an MSRP of $159.95. For more information, including ordering instructions, you can go to www.puttingalley.com. Well built, portable and provides instant feedback on your putting stroke…sounds like an ideal training aide for working on your putting stroke. Great review James! Great review. 1/2 inch wide seems almost impossible to keep the ball online. Very interested in this though. A good tool for and aggressive putting stroke, I like it. Thanks for sharing your thoughts James. Sounds like this could be fun and frustrating at the same time. Would look pretty cool on an indoor green as well. Nice work! This thing looks tough! I like it, may be the thing to help get me through the winter. Solid review James! Seems like a well built training aid that is just difficult and beneficial enough, while also being fun because it is such a challenge. Half inch sounds nearly impossible! Seems like an excellent Xmas gift for winter putting practice. Might be on my wish list. I really like this training aid. Sounds like it will be a perfect easy to use devise to get through the winter. Thanks for the very positive review. And we agree that it’s a well-done take on the old “yardstick” drill. In fact, we bring up the yardstick at tradeshows to see if people “get it”. About half the golfers do. But the absolute key difference between the Putting Alley and the yardstick drill is that you never have to bend over to set the ball! You simply drop a ball and roll it through the slot and onto the starting point using your putter. This makes it usable for a sizable chunk of session time, which means you will enjoy your practice and get more out of the time you spend on it. BTW, both the Original and Tour Edition are built with the best materials we could get, right here in the USA. Nice review! Sounds like a great training aid, and I know golf is an expensive sport, but am I alone in thinking $50 seems like a lot when compared to other putting aid devices? I see the benefit of being able to practice in small spaces during the winter especially, so maybe my perspective is off?? It looks like a very good putter training aid that can be used anywhere. I do agree with ‘teedupthoughts’ , $50 does seem a bit expensive. Although if it has a decent lifespan of perhaps a few years than $50 is probably not too bad. We don’t have any closure of golf courses here in Australia so we can play every month of the year. That being the case i’m always able to practice my putting at the golf course instead of in the living room. Nice review! Interesting product. Especially as winter approaches. I’m always looking to improve my putting, sounds like this device would be very helpful. $50 seems a little high to me but if that $50 were to provide me with more putts holed then I’d have to say it’s worth every penny! Thanks for the review. Thanks for the thoughts James. I think that the isolator would be great practice for “off season” use and trying to keep your game fresh for when the weather broke. But of course, also if you find yourself with the “yips” too! Interesting product. I’ve never even done the yardstick drill. This could be good for the off-season to keep your putting sharp. Hi james , which model have good putting feel? Tour or original?